With the final and rather brilliant Harry Potter film Harry Potter and the Deathly Hallows: Part 2 out this week I thought I would commemorate the release with posting about another location from the film. This location was used in most of the Potter films and features a quite prominently in Harry Potter and the Deathly Hallows: Part 2. It is of course King's Cross Station. In Part 2 of the epic finale, the battle between the good and evil forces of the Wizarding worlds escalates into an all-out war. The stakes have never been higher and no one is safe. 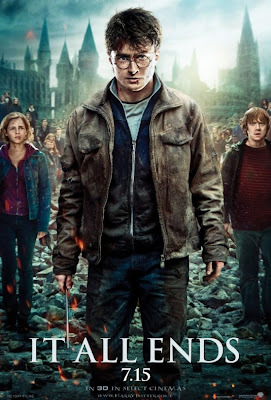 But it is Harry Potter who may be called upon to make the ultimate sacrifice as he draws closer to the cinematic showdown with Lord Voldemort. which is invisible to Muggle eyes. To gain gain entrance to Platform 9¾ one has to pass through the brick wall between platforms 9 and 10. Which is very time consuming so the chaps at British Rail came up with a clever solution - they built a replica of Platform 9¾ which is much easier to find and you don't even have to buy a ticket to visit it and take a photo. 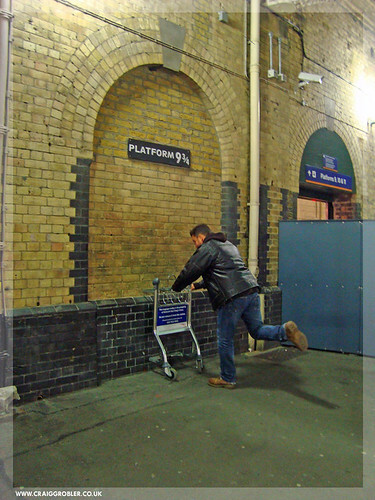 Platform 9.5 as seen in the Harry Potter films - Kings Cross Station, London, a photo by Craig Grobler on Flickr. You can visit Platform 9¾ by getting to King's Cross station, head to Platform 8, walk towards the end of Platform 8, at the walkway turn left towards Platforms 9. Or ask any of the staff they are always more than happy to help.